Besides being delicious, some of these well-received market products have also propelled vendors into new venues, from storefronts and restaurants to appearances in grocery chains. And such success stories are igniting aspirations among vendors who want to be the next Bruce Aidells Sausage Company (sold by its founder for millions in 2002), Blue Bottle Coffee (now with a roasting plant, online operation and retail presence) or Bakesale Betty (two cafes). “I want to be the Colonel Sanders of raw fast food,” says James Hall, proprietor of three-year-old Raw Daddy’s Fun Cones. With his long white hair, slouchy fedora and friendly painted fingernails, “I’m trying to make eating vegetables fun,” he explains. Fun aside, his products are extremely tasty — unique, sneakily healthy offering of savory and sweet filled flaxseed cones stuffed with enticing creations like spicy Thai salad, mushroom polenta and lemon macaroon cheesecake. Like many market vendors, Hall is putting substantial passion into his new venture. ” I went through my midlife crisis and got a little spiritual and instead of going after the 25 year old and the red Corvette, I read the ‘Omnivore’s Dilemma,'” explains the Peninsula resident. Now in three markets, Hall reports, “I’ve got my application in 40 more.” With free legal support from one of his many rabid customers, he’s also got plans for an eventual chain of stores selling his yummy, low-guilt filled cones and drinks such as fresh sparkling ginger lemonade. 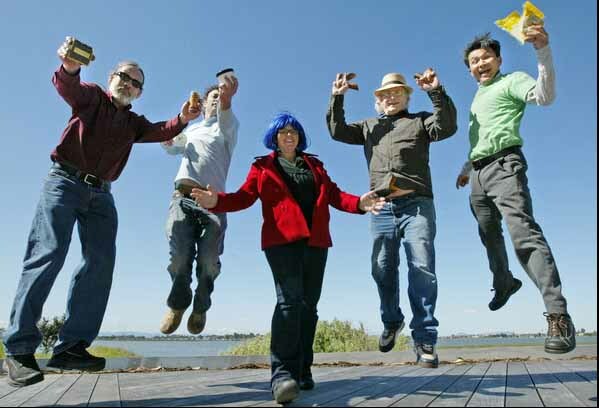 Successful farmers market vendors — and former vendors — (left to right), Peter Brydon, Barlovento Chocolates; Noah Goldner, Scream Sorbet; Alison Barakat, Bakesale Betty; James Hall, Raw Daddy Foods; Minh Tsai, Hodo Soy. For ambitious vendors like Hall and “Tofu Ambassador” Minh Tsai, founder of Hodo Soy, such support from well-heeled customers kick-starts business expansion. Tsai used investments by some customers for a gorgeous new plant in Oakland and a fast-growing retail operation, although Hodo Soy’s pristine white booths still appear in four farmers markets. A few bites into Hodo Soy products and it’s clear why some customers get financial fervor. Forget the jiggly white stuff that tastes like nothing. Tsai’s tofu is creamy and flavorful, particularly the labor-intensive tofu skin called yuba, which is cut into noodles for savory salads or turned into braised five-spice or curry nuggets. This tight relationship with customers has impacted ponytailed, soft-spoken Peter Brydon. Laid off in 2006 after 28 years as a printer, he turned a hobby into Barlovento Chocolates. 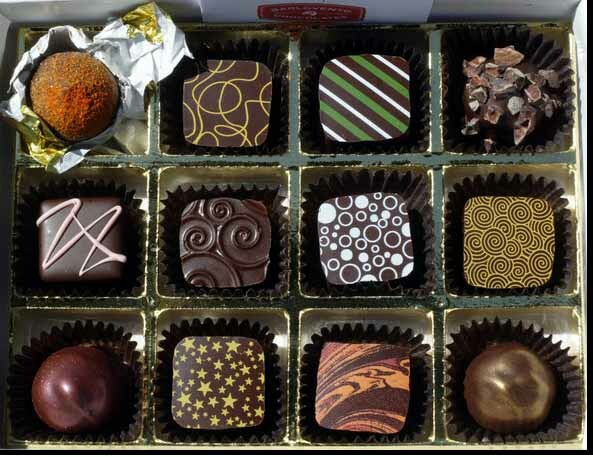 Among the scrumptious French-style truffles in his repertoire are customer flavor ideas like fiery Mayan Hot Chocolate, composed of cinnamon and vanilla bean-flavored ganache surrounded by his single-source Venezuelan chocolate that is then crowned with cayenne. Hola! “Most of my flavors have snap. They jump out at you,” says Brydon. This has attracted customers to such a degree that his products have moved into some select stores. Farmers market customers also play a key role in his popular Meyer lemon zest truffles, whose fruit “comes from Bay Area back yards,” he reports. An easy call for the customers who trade their fruit for his chocolates. Customer feedback and local ingredients are also essential for crowd-pleasing Scream Sorbet — and can be a curse when availability falters, such as nuts for Scream’s mind-bending chocolate hazelnut sorbet. According to co-founder Noah Goldner, it’s back now, joining habit-forming flavors like cashew caramel, Seascape strawberry and coconut Thai basil. The new tragedy for Scream’s legion of fans is its scaled-back presence at farmers markets since the recent opening of its Oakland storefront. Goldner reveals that “Actual operating costs might be 50 per cent more” at a farmers market, so Scream addicts will have more driving in their futures. Although her habit-forming kale chips recently expanded to two retail locations, Mighty Mouth Foods proprietor Rachel Phelps says she is still committed to farmers markets. The Los Altos Jazzercise instructor — she wears floaty clothes and still has a touch of her native British accent — had a hazy plan to start a healthy food business but inspiration came after sampling a revelatory vegetable chip. Before then, “I thought kale was a decoration,” she laughs. But her kitchen experiments resulted in delectable, “dried, not fried” Krunchy Kale with tasty flavorings. Sadly for farmers market regulars, some vendor success stories like Alison Barakat — a.k.a. blue-wigged Bakesale Betty — have packed up their booths entirely. The Australia native and Chez Panisse alum now feeds those with a jones for her legendary fried chicken sandwich and baked goods at two thriving Oakland cafes. Then there’s her new partnership with Williams-Sonoma, which is selling a mix nationwide for her renowned ginger cookies, with more items in the queue. 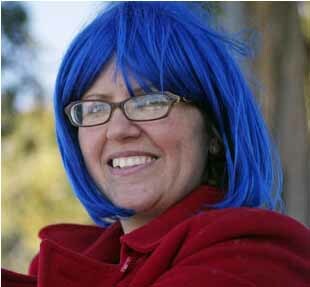 In her blue wig, Alison Barakat – a.k.a. Bakesale Betty — has developed such a following for her amazing food that she now runs two cafes in Oakland. Her most famous and coveted recipe is her fried chicken sandwich, of which more than a thousand are sold daily. Farmhouse Culture Kraut – That limp canned stuff in the supermarket is as similar to their toothy, tangy fresh sauerkraut as dirt is to foie gras. Find them online, at many natural foods stores and at these markets: Campbell, South Palo Alto, San Mateo, Aptos/Cabrillo, downtown Santa Cruz and Oakland (Jack London Square). Frog Hollow -This Brentwood farm grows miraculous stone fruit but a more recent focus is superb preserved, chutneys and celebrated baked goods like cookies, galettes and turnovers. Besides their Ferry Building and online stores, the prepared items can be found at the Berkeley farmers market. g:m:me Bakery – As if the charm of Irish family recipes “from granny to mom to me” (hence the name) weren’t enough, the small-batch items are also delicious, like fruit-rich scones, traditional brown bread and chocolate orange crackle cookies. Find them at the Mountain View, Willow Glen and Los Gatos markets. M&M Brittany Gourmet Dog Biscuits – Fido gets in on the health act via homemade treats such as baked liver strips, smoked pork and huge sellers like peanut butter biscuits and training nuggets, found at the markets in Campbell, Oakland (Temescal) and Danville. Oaxacan Kitchen – This massively popular vendor started at the Palo Alto market, expanded to a restaurant — also popular — then shifted its business to a combination of the markets, a food truck, catering, team building and classes. Fans happily devour their handmade moles however they can get them. Current markets include Los Gatos, Santa Clara, Sunnyvale and three in Palo Alto. Phoenix Pastificio – The secret weapon behind superb pastas and breads served at top Berkeley-area restaurants is also transforming home dining for many market customers. Plus, divine sauces, ravioli and baked goods also keep the lines long at these markets: Berkeley, Oakland (Grand Lake, Temescal, Jack London Square, Montclair) and El Cerrito. Roli Roti – The rotisseried free-range chickens marinated in “secret spice” and the outrageous rosemary potatoes cooked in the chicken drippings are the main event but two fortunate markets also carry the drool-worthy porchetta sandwich: Ferry Plaza and Oakland (Grand Lake). Otherwise, visit the markets in Los Altos, South Palo Alto, San Mateo, Alameda, Daly City, Oakland (Montclair) and Pleasanton. Top Nosh – The focus here is hand pies with flaky pastry and wonderful fillings such as chicken, apple, cheddar and wild mushroom with gruyere. The pies are now sold in many high-end grocery stores and a cafe is open in Willow Glen, along with booths at farmers markets in Campbell, Saratoga, Mountain View, Los Altos and South Palo Alto. 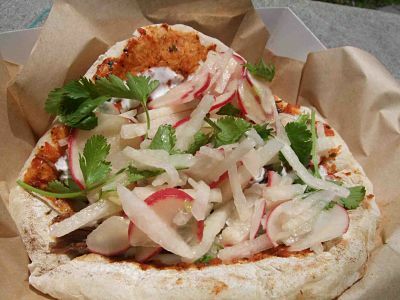 Vesta Flatbreads – This vendor’s utterly irresistible handmade flatbreads support mouth-pleasing toppings like braised pork with fennel slaw and grilled chicken with harissa. Conscientiously organic but also a foodie magnet, Vesta has plans for a food truck and eventual storefront and is currently attending markets in Walnut Creek, Oakland (Grand Lake) and San Rafael. Vesta Flatbreads are well worth a trip to the farmers market. Not all farmers markets have the food courts, music (sometimes) and lively environment that attract shoppers looking for more than berries and lettuce. Here is a small sampler of some markets that do throughout the region. San Francisco/Ferry Plaza – This is the granddaddy of them all, even when one of the three weekly markets isn’t in session — just stroll into the building and shop at food boutiques runby a who’s who of Bay Area food artisans. Otherwise, the best food markets are Saturday and Thursday. Los Gatos – Although on the small side, this cheerful market near a little park has some nicely selected food vendors, from crepes and tamales to vegan wraps. During its 19 years, it has also helped launch some food vendors into prominence. Campbell – This big, thriving, festival-like market has a few rows of food vendors that touch all the popular bases, with fans raving about the crepes, Mexican foods, Indian wraps and much more. South Palo Alto – Only around for three years, this market has rapidly expanded its vendor base and audience. It’s now the Peninsula’s happening place for terrific food vendors, such as Scream Sorbet, Mighty Mouth Foods, Barlovento Chocolates, Hodo Soy and Raw Daddy’s Fun Cones. Oakland/Grand Lake – It’s huge and chockablock with every kind of ethnic food, snack and treat imaginable. Even stellar salumi maker Boccalone sells here. Proving that Oakland is becoming the Bay Area’s foodie capital is the fact that the slightly smaller Temescal market is just as good. Santa Cruz/Downtown – Like other afternoon markets, this one features a higher proportion of food vendors to assuage the after-school/after-work munchies. A popular market with some good edibles, it also offers cooking demonstrations, crafts and even bike valet parking. 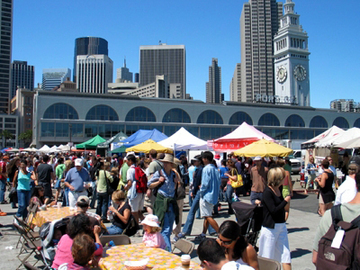 Many food vendors have stands at the farmers markets at San Francisco’s Ferry Plaza. 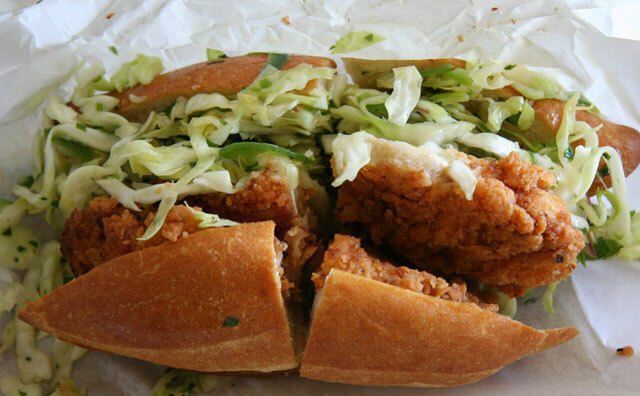 The only problem with Betty’s renowned fried chicken sandwich is that it clocks in at over 900 calories. Preparation 1½ hours. Cooking and assembling: 15 minutes. 1. Make the vinaigrette: In a bowl, combine the mustard, vinegar and salt. Slowly whisk in the olive oil until well blended. Set aside. 2. Make the coleslaw: In a medium-size bowl, combine the sliced onion and vinegar and let stand at least 20 minutes. With a strainer, drain the onion, discarding the vinegar. Return the onion to the bowl and add the jalapeño, parsley, cabbage and salt. Add the vinaigrette and toss to coat the ingredients. Cover and refrigerate the coleslaw until the chicken is ready. 4. Pour the vegetable oil into a large stockpot, filling it no more than halfway so that any oil spatters stay inside during frying. Place the pot on a burner over high heat and raise the oil temperature to 365°F, checking frequently with a digital or candy thermometer; adjust the heat to keep it at a constant temperature. Meanwhile, prepare the chicken. 5. In a wide shallow bowl, stir together the flour, cayenne pepper, salt and black pepper. Using tongs, lift one chicken breast out of the buttermilk, allowing some liquid to drip off, then dredge the breast in the flour mixture. (During this process, don’t shake off excess buttermilk or flour.) Return the coated breast to the buttermilk, then dredge it again in the flour. (Double dredging creates a thick crust.) Coat each breast the same way. An overwhelming hit among market customers, this delicious concoction is no longer offered there, alas. Choose high-quality chocolate for best results. 1 Hodo silken tofu, 16 oz. 1. Heat all ingredients over double boiler, stirring occasionally, just until the chocolate melts. Be careful not to overcook. 2. Pour into a large bowl. Whip with immersion blender until evenly mixed and completely smooth. Continue stirring along the surface to incorporate air for approximately 10 minutes. 3. Pour into single serving dishes and refrigerate for at least 4 hours before serving. Garnish with whipped cream or a cookie. Whether turned into strawberry shortcake or spread with a delicious jam, these biscuits are habit forming. 1. Mix dried ingredients in mixer. Add butter, mix until butter resembles small peas. Add cream, stop mixing before totally incorporated and mix the rest by hand. 2. Roll out into a rectangle about 1 inch thick on floured surface. Brush of excess flour, fold on itself once. Roll out 3/4 inch thick, cut into 2 1/2-inch rounds. 3. Freeze or refrigerate until ready to bake. Preheat oven to 350 degrees. Brush tops of biscuits with egg and cream wash (1 yolk and 1/4 cup cream or milk) and sprinkle with sugar. Bake for 25 minutes or until golden. 1, 8 oz jar Frog Hollow Farm conserve. 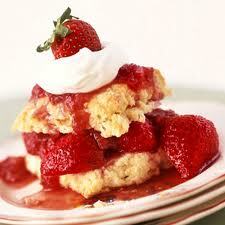 Cut shortcakes in half horizontally and 2 heaping serving spoons of desired filling. Set top of biscuit on filling, slightly offset and serve with a dollop of lightly sweetened whipped cream or crème fraiche. Combine 1 lb rhubarb cut into ¼-inch- thick pieces with 3/4 c sugar in a saucepan. Cook until rhubarb is tender but not falling apart, let cool add blood orange sections. Wash, de-stem and slice strawberries. Add sugar and let macerate for 1-2 hours. Add 1 tablespoon Meyer lemon marmalade or orange marmalade or a little passion fruit juice. 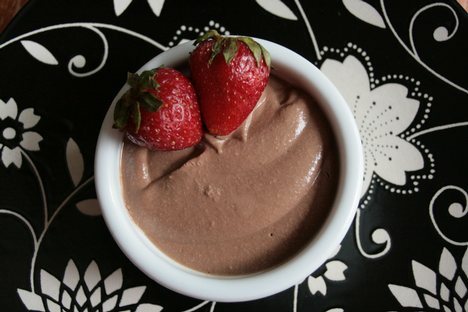 This entry was posted in Chocolate, Food Articles, Recipes and tagged farmers market. Bookmark the permalink.